We left the office mid-morning and arrived at the project site around noon. There we met with the NGO staff who are implementing the project, which involves building awareness of environmental issues, improving industry compliance with the regulations and involving communities in monitoring. You may recall from the last time I was here that we also visited the site then. This time, however, it wasn’t pouring rain, which made all the difference for being able to see things and wander around. The area is highly populated with textile factories, where fabrics are processed and dyed, using a lot of water and producing a lot of highly contaminated wastewater. Most of the factories do not have treatment plants to treat the waste and as a result the water flowing in the streams is purple. It’s hard to describe the enormity of the environmental damage that is going on here. I hope my pictures give some idea of the scale. 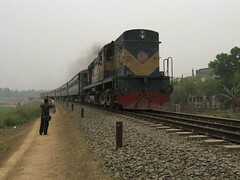 We wandered along a train track for a short distance to see some of the pollution that exists. 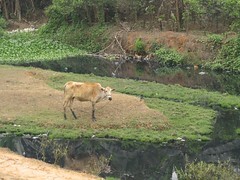 There we saw cows tied to stakes in the ground right beside polluted streams and also lots of semi-rural settlements along the streams. The water flowing in the streams is highly polluted, with chemicals, dyes and also garbage and likely human waste. Where the streams flow into a larger creek the smell was unbearable. We were lucky enough to see a train go by though, which was neat! No one was riding on the roof though, which often happens here. After walking around we went to see a fish sanctuary that has been constructed in the Turag River, which is the river into which all the polluted streams and creeks flow. There we spoke with some community members who will be involved in monitoring industries to make sure they are using their treatment plants. It was really interesting to be able to walk through a rural community and see how people here live. 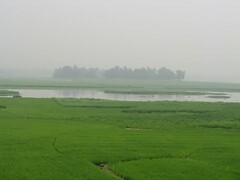 To me it was very densely populated for a rural area. 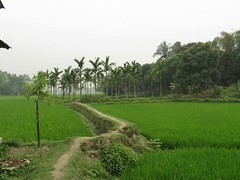 Compared to the Altiplano in Bolivia, rural Bangladesh is a city. I suppose that is to be expected in a country with such a high population density. After seeing the area again, and more of it this time, I came to the same conclusions, or lack of conclusions. With the government basically ineffectual at enforcement, what incentive do industries have to comply with the regulations and stop polluting the environment and damaging the health of communities in the area? People eat the fish from the river; they wash in the water causing skin problems and other health issues; they grow rice in the water…the list of impacts goes on. Where do we start to even attempt to remedy this situation? The saddest part, to me, is that things are not going to get better with the economy they way it is. In a recession, the government will be more focused on jobs, at any cost, to try to stave off mass unemployment in the country. What is one more factory with a little more effluent really going to do? In addition, factory owners, under pressure from buyers like Walmart, will be forced to lower their prices at the cost of the environment. Often even if factories do have treatment plants they don’t run them all the time because this costs money and affects the price of the product. We as consumers in the developed world need to make informed choices, which would put pressure on buyers to buy from factories that are following the rules. Cheaper isn’t always better. But this is only part of the solution and also one that will not get easier with tighter cash flows in developed countries. So, that was my day out of the city. It was interesting. It was also mind-boggling. Something has to change, but I’m not sure it will. Submitted by Meg on Thu, 2009-03-19 22:37. But we have to at least hope that by continuing to do little things, something will eventually change and the situation will improve for these people, and for the environment in general. Submitted by kevin@haggaret.com on Thu, 2009-03-19 13:41.